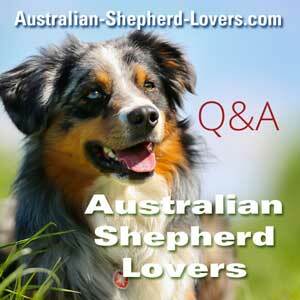 What "Job" Can You Give An Australian Shepherd? When people say you need to give your Aussie a "job" what does that look like practically? Comments for What "Job" Can You Give An Australian Shepherd? Aussies are smart and quick to learn, so you can teach them to do all kinds of jobs. My boy brings my slippers in the morning after our walk. He helps me make the beds by pulling on the sheets etc - although this can turn into just fun! He also brings me the mail, helps bring in some groceries, puts his toys back in the box - there are a lot of possibilities! If you have animals, it's easier. Your Aussie may enjoy herding the chickens, ducks, horses, etc... I used to have a border collie who spent a lot of the day herding my daughter's ducks and one of the horses. This particular horse enjoyed the "game". I no longer live in the country. I have a house and a small yard on a river in Florida. My Aussie has the job of defending the house (gently) and she has been assigned the job of keeping birds off our dock (very useful when there is a flock of poopy vultures!). She takes this job very seriously, and if she sees (through the windows) birds ON the dock, she gets extremely excited and demands to go out and chase them away. She then expresses pride in a job well done. A "job" can be any task you want to give your Aussie. This can even include daily agility routines in the yard, obedience or trick sessions during the day, "working" for each meal by performing a set of commands before being allowed to eat. If your Aussie loves people, consider having her become certified as a therapy dog and her job becomes bringing a little joy into the lives of many people in hospitals or institutions. So a job can be for a dog what it is to people: a task that brings meaning and a sense of accomplishment.